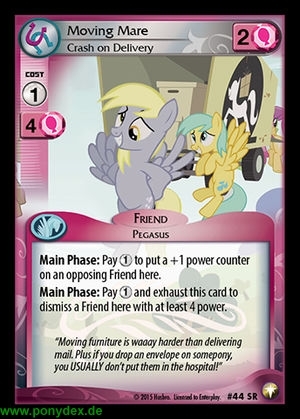 Main Phase: Pay 1 action token and exhaust this card to dismiss a Friend here with at least 4 power. "Moving furniture is waaay harder than delivering mail. Plus if you drop an envelope on somepony, you USUALLY don't put them in the hospital!"